This high-quality pressure regulator is used to reduce the pressure of approx. 54 bar within the gas cylinder to a working pressure of approx. 1 to 3 bar (maximum working pressure 3 bar). 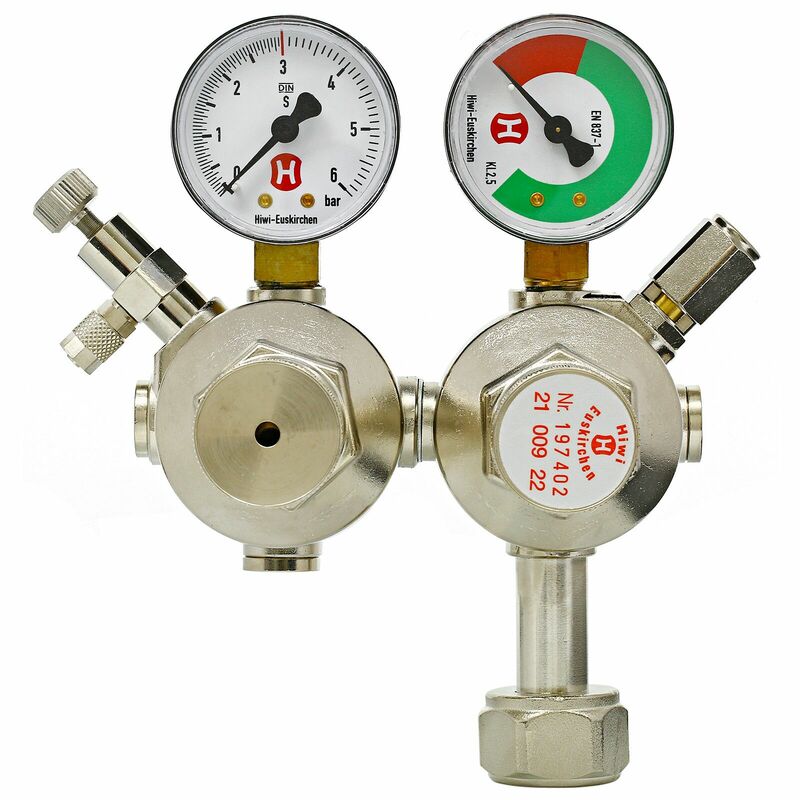 By combining the working pressure manometer and the cylinder pressure manometer you can regulate the CO2 supply very precisely and you know at once when it is time to refill the cylinder. The integrated fine needle valve allows a very precise regulation of the CO2 supply for the aquarium. Thanks to the double chamber system, the working pressure remains constant until the cylinder is completely empty. When pressure regulators without a double chamber system are used the working pressure may rise relatively fast and abruptly as soon as the gas filling inside the bottle goes below around 20% of the nominal filling quantity. If you do not re-adjust manually in such a case, the amount of CO2 supplied to the tank will increase significantly and surmount the dosage that was originally set. If you do not want to take on this task, the remaining 20% of CO2 would need constant adjustements of the working pressure. With this double-chamber pressure regulator, on the other hand, the cylinder can be emptied almost entirely without the need to adjust the working pressure for the last 20% of CO2, which is of advantage especially when you use large CO2 cylinders. In a 10 kg cylinder, e.g., around 2 kg of CO2 would need constant adjustments regarding the working pressure. Please keep in mind that the manufacturer has glued the needle valve to the pressure regulator. Thus it can not be removed without damage. If the needle valve is removed, the manufacturer's liability will expire prematurely. Hiwi is a renowned German manufacturer of CO2 pressure regulators. The highest level of quality and a long useful life are in their focus. These high quality standards do not exclude attractive prices, though. Especially in aquascaping, the addition of CO2 for the plants is something very basic, and thus it is really important to choose good CO2 supplying equipment. Hiwi meets even the highest quality standards in every aspect und is thus the best choice when it comes to CO2 pressure regulators. Ein sehr präziser Druckminderer, besser als alles andere was ich von Dennerle und JBL kenne! . . . . .
Ich habe den Druckminderer erst seit Kurzem in Betrieb, kann also noch nichts über Langzeit sagen. Einstellen lässt er sich schonmal sehr einfach und macht auch wegen des Gewichts einen sehr soliden Eindruck. - Wieso ist er vor und nachdem ich bestellte 20.- günstiger?! Kommentar Aquasabi: Der Druckminderer wurde Ihnen ~20 EUR günstiger angezeigt, da Sie in einem Drittland (außerhalb der EU) Ihren Wohnsitz haben - Anzeige ohne Umsatzsteuer. Sie haben sich das Produkt jedoch an eine deutsche Adresse schicken lassen, weswegen wir die 19% USt. berechnen mussten. In das Drittland hätten wir natürlich USt. frei verschickt. In Kombination mit einem Inlineatomizer ist es kritisch wenn der Flaschendruck schlagartig steigt, mir ist es einmal passiert und ich wollte nicht das mein Besatz wegen so etwas drauf geht. Der Druckminderer ist extrem hochwertig, aber auch extrem groß, verglichen mit normalen Stufen. Da ich genug Platz habe kein Problem. Ein Teil das mir bestimmt noch lange erhalten bleibt.